Hello everyone! 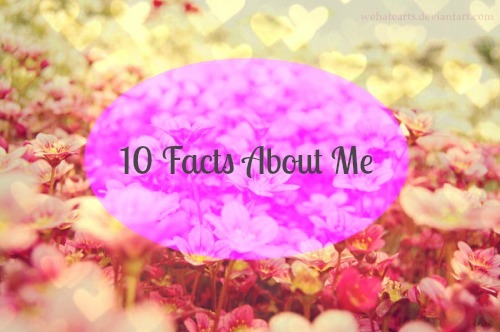 Today I thought that I would do another personal post introducing you to some more facts about me. I have done a couple of these over on my blog before, however now that there are over 1000 of you following me I thought that why not do another one. I don't really consider myself an interesting person however some of you may or may not agree with that statement. I'm rambling, so let me just get into the facts. The new trailer has just been released for the new film coming out at Christmas and I'm not going to lie here, I definitely did a little happy dance around my bedroom. I absolutely love Star Wars. I definitely had a little crush on Luke Skywalker from the original films and then on Anakin Skywalker in the newer films. Hello Hayden Christiansen is bloomin' gorgeous!! I envy Rachel Bilson! If you aren't aware what this is, it basically means I can write with both hands. I started life as a left hander however my mum encouraged me to write with my right hand as I was growing up. However I always used both. It definitely came in handy in school exams let me tell you! I loved bragging to people that I could write with both hands too. I don't know about you but it's something I don't hear from people everyday. You may not think this if you follow me on twitter as I do come across fairly more confident than I actually am but I'm really bad. I talk but I tend to keep to myself and I'm really quiet when you first meet me. However trust me when I say you can't shut me up after a while. Blogging is definitely giving me a lot more confidence and stuff to meet new people so it's definitely something that I am learning. No, not in a creepy way I just absolutely love them. Westlife were my absolute favourite band growing up. Other boybands I loved growing up included N'Sync, Blue, Take That, Backstreet Boys. A1, Go forward 10+ years and I absolutely love One Direction, JLS and my new favourite boyband Collabro. I just can't get enough of them. Sorry! My mum is from Mauritius and my Dad is from Scotland. However both of their sets of parents were from different countries too. All together within my family there is Irish, German, French, Indian, and of course English as I was born in England. It's no wonder I'm so obsessed with travelling. Before you judge, yes I have worked. I've actually had jobs most of my life. I've just been here, there and everywhere. I've worked in a tutor centre two days a week since I was 15. I then did work experience at a council where my Dad worked, I worked in a hair dressers again as work experience, I then worked as a canvasser for a little while which involved getting people to fill in forms entitling them to vote. I then worked with an event company whilst I was at university. Once I graduated university I got a job with Thomas Cook as a kids rep overseas which was amazing. I then came back and recently completed a months work experience in a job centre. I've just got a job working with British Airways on Check-In at Heathrow Airport too which I've super excited to start. Did I mention I'm quite adventurous? Oh I also babysat and child minded for a short time too! Anyone who looks at my iPod thinks I'm ridiculous because I have everything from opera, to RnB to pop to musical music. I have absolutely everything on there, it's crazy. The only music I don't like and I could never listen too is really heavy metal. I've tried it and it just didn't agree with me. Sorry heavy metal lovers! When I first created a blog I thought let me start off with my first and middle name and then see where it goes and I might change it. However I just didn't have a clue what to call it and I still have no idea. I guess having your name is easier but I just wish I chose a name that reflected more of my personality and what my blog was about. Ah well! FleurDanielle will have to do! They are just so slimey and horrible. A few years ago I was on holiday with my family in the South of France and two small grass snakes slithered their way in front of me. I think I screamed for around 10 minutes! I click my feet (don't ask how), sleep, walk, talk, laugh...I'm literally a nightmare when I sleep. I've had the recordings to prove it trust me...I'm just weird. So there you have it. Just a few random facts about me. Let me know if you'd like me to do most of these posts and I'll try and think of a few more interesting things about me you may not know. Let me know in the comments one interesting/funny fact about you! Hey! Haha I loved this post. It allowed us to get to know you a little more :) I'm actually so glad there are still people out there who remembers Westlife let alone liked them! I'm always working with youth and adolescence and they have no idea who even NSync or Backstreet Boys are.. ah the good days, right? Lovely post, some interesting things there. I love your blog name it sounds lovely, but if you don't like it you can change it. I used to write a blog and I ended up hating my blog name, so I kept the address the same, but just changed the blog name and my twitter name and felt much happier. One little fact about myself is a hate spiders and once woke up in the middle of the night thinking a giant spider was chasing me, I ran all the way downstairs screaming, thank goodness I realised it was just a dream before I ran down the street.